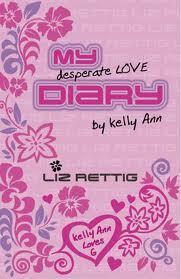 Kelly Ann is fifteen and desperately in love with G – the biggest idiot in school. Her best friends Liz and Stephanie can see how awful G is – and also that Kelly Ann’s quietly gorgeous friend Chris is madly in love with her. But Kelly Ann stumbles along blindly, unable to see what’s right in front of her eyes. Categories: Humour, Romance, Scotland | Tags: Liz Rettig | Permalink.